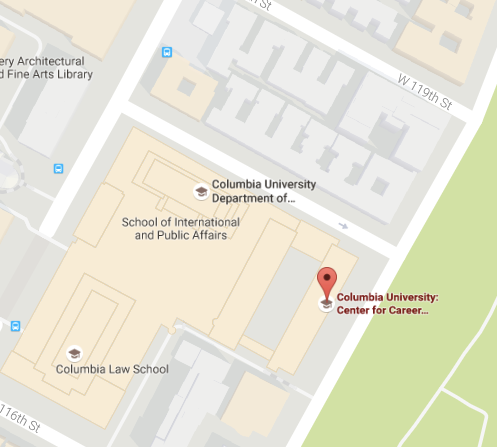 The CCE Startup Career Fair - held during the Spring semester - is focused on connecting startup firms with entrepreneurially minded students and alumni at Columbia. Video of Stand out by taking inititative. Practice your introduction – What do you hope the employer will remember about you? Understand the atmosphere – While professional, start-up fairs are of a more casual nature than traditional career fairs. Bring ample copies of your resume to hand to employers, printed on resume stock paper. Bring a folder or portfolio to keep resumes, brochures and business cards organized, and a pen and paper to take notes. Have an electronic copy of your resume accessible, so you can quickly email it along if requested. Do research! Learn about companies attending and positions they’re looking to fill. Show your interest by forming a list of questions for each of the employers who you plan to meet. Ask questions beyond what’s available on their website — remember, this is a chance to get “insider” information about hiring practices, what types of candidates they look for, trends in the industry, etc. Bring ideas you have for innovation! They may have already heard them, but this proves your interest in helping the company develop. They’ll be excited about your excitement, as long as you go about it respectfully. A resume isn’t all employers are looking at these days; your online presence matters. Create a professional web site or blog that shows your career interests and/or samples of your work. If you’re just getting started, AboutMe, Tumblr or Wordpress can be useful in helping personalize your design. Include your professional web site, LinkedIn, Twitter, Google+, Tumblr, or Instagram link/handle on your resume. Follow the companies online through their web sites, blog, or other online presence. Sign up for their newsletters. You’ll get a better insight into their culture, interests, and needs. Create a small, basic card with your email, phone number, and social network handles to hand out. Columbia Print Services offers discounts on business cards. For this Fair, keep calm with business casual. A full suit/tie is not needed, as the atmosphere is more relaxed. Be neat, be presentable, and be up-to-date. Appropriate Attire: Khakis, skirts, slacks, dresses, collared shirts, blouses or sweaters, casual shoes, heels or flats. Ties may be optional. No sneakers or sandals. Plan your approach! Look over the layout, check the room set up, and get a directory of attendees. Check your appearance, freshen your breath, and silence your phone. Remember that some of these representatives may be the founders of the companies. Demonstrate your knowledge, dedication, and excitement of their organization. For a lot of these companies, it’s the expressed interest that can get your foot in the door. Shake the employer’s hand, smile, and clearly state your name. Speak with confidence and express genuine enthusiasm and interest. Ask thoughtful, researched questions. Swap contact information. These could very well be the primary access to an opportunity of a lifetime. Use any product or service a company has on display! People who work at start-ups are typically passionate about what they’re creating, and want you to be too. Thank the employers for their time and make sure you know the best way to follow up after the Fair. Enjoy yourself and be engaged! Involvement leaves an impression. Don’t get intimidated. These are companies like all others, just with a stronger focus on interpersonal relationships. At their core, they’re still looking for dedicated individuals with the right skills sets. Take breaks! Try not to get overwhelmed by the amount of people you’re meeting. Within 24 hours, reach out and thank the employers you met. This polite tactic shows not only your dedication, but your considerate nature. Check out CCE’s Thank You Letters guide for help. Refer to your notes about the employers and follow up on any information or action requested. Ask any lingering questions. If you don’t hear a response within two weeks, feel free to email again. Start organizing the contacts you made. Take note of place, last date of contact, and notes. If appropriate, look contacts up on LinkedIn, but make sure to individualize the request. Remind the employer where you met.